In Lotus Notes, canonical is the text file that saves information like server name, user name, group name, etc. A user can map all these details with SMTP of desired domain name. Export Notes software supports PST file from Outlook 2016, 2013, 2010, 2007 and all the lower versions. This tool can easily convert Lotus Notes NSF files to Outlook PST format. You can transfer data items like Emails, contacts, calendars, Tasks, Notes, Journals, etc into Microsoft Outlook with all the Meta attributes intact in the converted file. Using Lotus Notes to Outlook Converter, one can convert NSF emails along with attachments to PST file format. Attachments include data like images, documents, etc. The software can perform export process without any data loss. Lotus Notes NSF to Outlook PST Converter helps a user in maintaining the folder hierarchy after the conversion process. The directory hierarchy of the output PST mailbox file will remain the same as it was of NSF file. NSF to PST Converter can break large PST file obtained during conversion process into smaller parts. Once the exported file exceeds the mentioned size, it will automatically divide the file in MB/GB as specified. Lotus Notes to Outlook Migrator helps in mapping Lotus Notes database folders with PST file of Outlook. You can easily map Inbox of NSF file with Inbox of Outlook to verify the data i.e. saved in these folders. A user like German, French, etc user can change the name of the folder and map it. In this tool, you can apply Date-based filtering option to emails, calendars, journals, to-do lists, etc. You can select data from a specific date range. You will get all the data of that date range. It is important to know that the data from the preceded and succeeded date will be excluded while conversion. NSF to PST Converter allows you to select specific folders from the bulk data to migrate from Lotus Notes To Outlook. One is permitted to choose selective folders or components from Notes database instead of all. The tool allows you to save the HTML formatting like Hyperlinks, signatures, etc of emails with images. There will be no changes done to the formatting of emails or documents during or after the conversion process. If you have encrypted NSF emails, then also you can perform migration process with the help of this tool. Encryption can be for security reasons but in Outlook, you can use Remove Encryptions option to remove the security from these emails. After exporting the data from Lotus Notes database file to Outlook PST, the tool will generate a status report that will show the data like name, emails, contacts, calendars, tasks, etc that are exported to the PST format. The Graphical User Interface of the application is quite simple & enhanced. It is very easy to run this tool by any non-technical user. It is integrated with so many features that it can migrate data items like emails, contacts, calendars, journals, etc as per user’s needs in an effective way. Lotus Notes to Outlook Converter helps a user to detect & export set of canonical name format of any senders' email address to the selected database. There are two options to set SMTP name by one SMTP name for all canonical values or individual name for each in a CSV file. It is easy to exclude duplicate contacts during migration of Lotus Notes address book to Outlook. You can customize the duplicate contact(s) and exclude them out. According to the default settings full name, address & mobile number will be deleted. The tool is compatible with Microsoft Outlook 2016, 2013, 2010 and all the below versions. It creates PST file in Unicode format i.e. supported in all the latest versions. It supports both 32 as well as 64-bit Outlook versions. Export Notes Tools helps a user to map CN Values by browsed Names.nsf file. One can easily replace the CN Value with its email address & contact information from the address book of Lotus Notes database file. The tool supports Lotus Notes 9, 8.5 and all the below versions. It is very important to install & configure Notes application for the smooth functioning of the software. MS Outlook: Microsoft Outlook is required to be installed and configured properly for valid or dummy profile/account. Lotus Notes – IBM Notes 9.1, 9.0, 8.5, 7, 6.5 versions are supported. Explain the working of the software in brief? Step 1: Install & Run NSF to PST Converter tool. Step 2: Browse and add NSF file which you want to export. Step 3: Select specific folders you want to migrate and click on Next button. Step 4: Apply Date-based filter and select data items like emails, contacts, calendars, journals, etc from particular date range. Step 5: Click on Export button & proceed with the conversion proess. Step 6: After complete migration, you will get a status report which shows data items that are converted from NSF file to PST. Step 7: At the end, you can open PST file in MS Outlook and access your Lotus Notes data easily. How many Lotus Notes NSF file can I export to Outlook PST files? NSF to PST converter software allows loading two NSF file at the same time one is the database file and the second is the names.nsf files. What should be the size of Lotus Notes NSF file to convert into Outlook data files? Lotus Notes to Outlook Exporter tool does not inflict any file size limitation to save NSF to PST files. Load any size or any type NSF files. 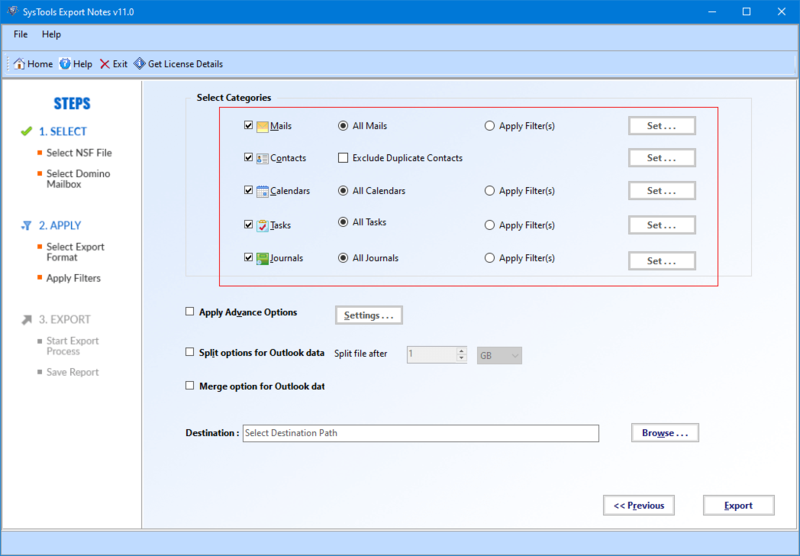 Can I migrate Encrypted Lotus Notes NSF to Outlook PST files? 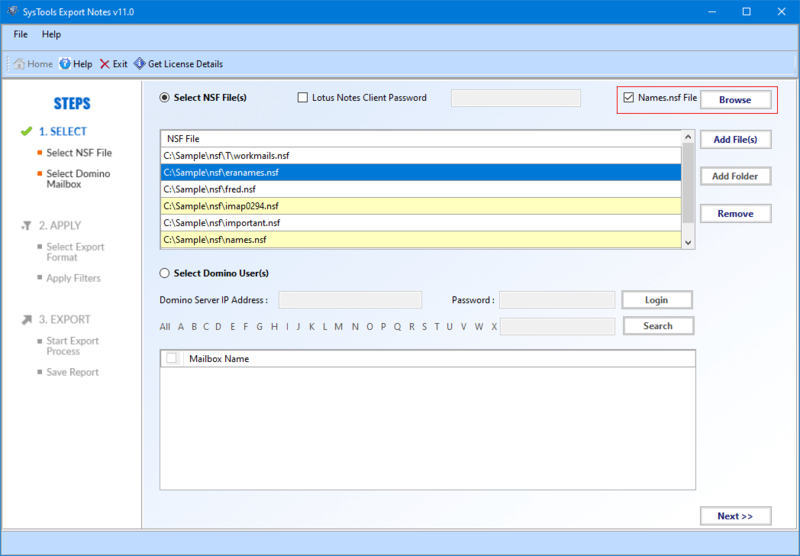 The NSF file to PST Migrator tool allows removing encryption from Lotus Notes files and export NSF to PST. Can I browse Lotus Notes 7 NSF file for conversion? The tool is compatible with any versions of Lotus Notes including 9.0, 8.0, 8.5, 7, etc. Easily save NSF to PST from any version of Lotus Notes. Is there any platform dependency to convert NSF to PST files? NSF to PST exporter supported by any versions of Windows OS such as 10, 8.1, 8, 7, etc and converted PST files opens with any editions of Outlook like 2016, 2013, 2010, etc. "Such a wonderful tool to convert NSF file to PST file easily without any kind of limitation. Currently, I am using Microsoft Outlook 2013 and I can open converted PST file with the help of Lotus Notes to Outlook Converter with all the attachments. The application is compatible with any version of Windows OS. I like this converter software very much! " "I was looking for a tool through which I can browse Lotus Notes 8 NSF file and export it into Outlook PST file. My search is ended here. It was a nice experience to use this application. The tool supports multiple features like advanced filter option that allows me to export only important data from NSF file to PST. Thanks to FreeViewer team!" 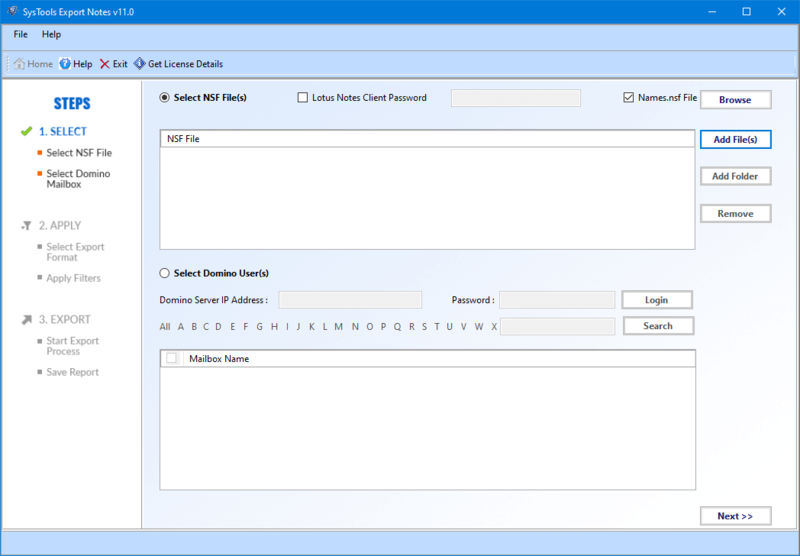 "The interface of FreeViewer NSF to PST Converter is quite simple that it was easy to migrate data from Lotus Notes to Outlook. It was very challenging to complete this task in IBM Notes as it is very complex. But this tool helps me a lot in completing the migration task easily and quickly. I must say that this tool is enough worthy to buy!" "A project was given by my boss to convert thousands of emails from Lotus Notes email client to Microsoft Outlook. It was really difficult for me to complete this task on time. As manual procedure was time-consuming, one of my friends suggested me to use this utility. I got surprised with the efficient working of NSF file to PST Converter tool. This software is amazing and effective in terms of migration of data without any loss of single bit."